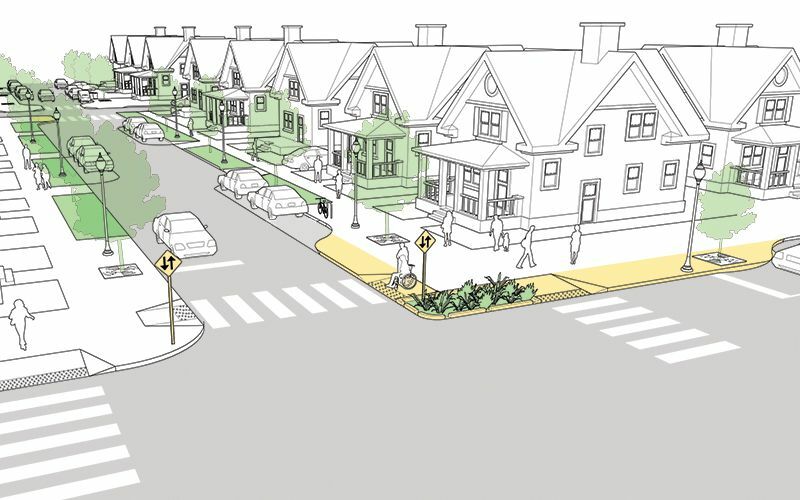 2-way yield streets are appropriate in residential environments where drivers are expected to travel at low speeds. 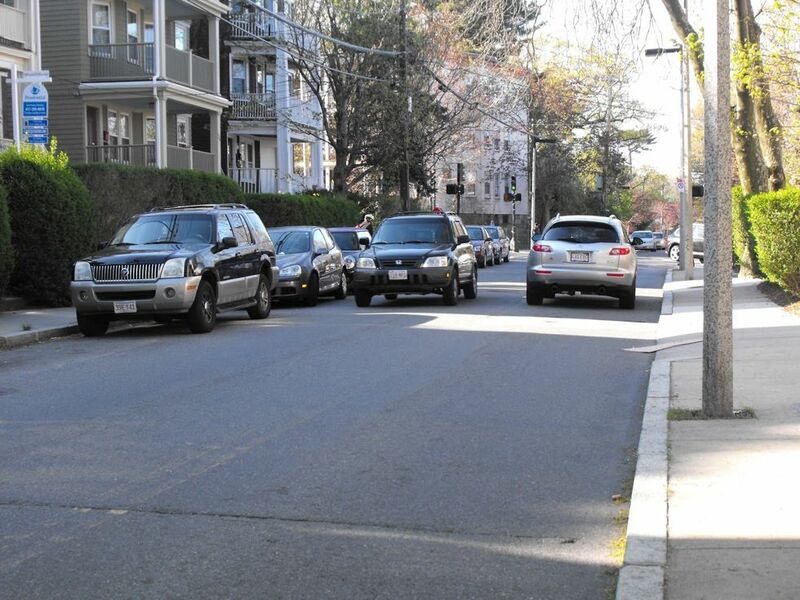 Many yield streets have significant off-street parking provisions and on-street parking utilization of 40–60% or less. 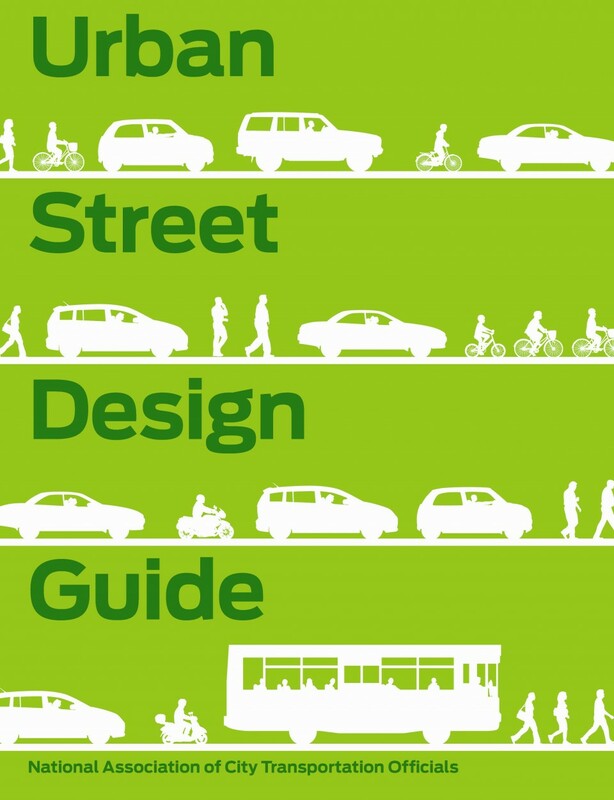 Create a “checkered” parking scheme to improve the functionality of a yield street. 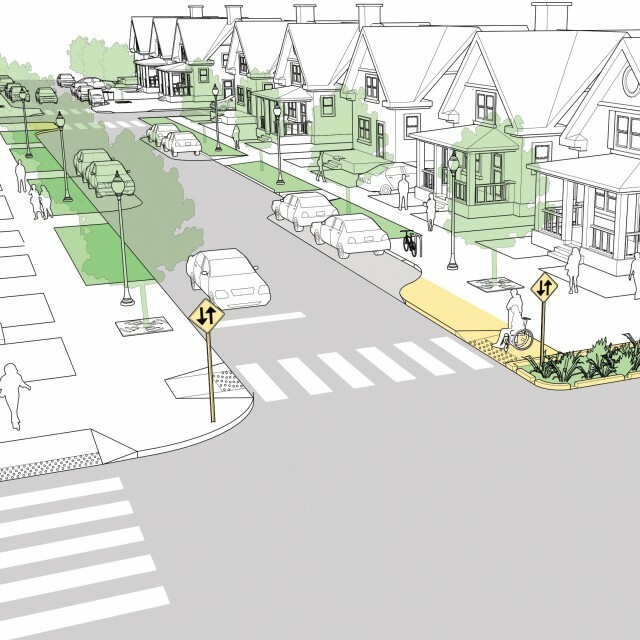 The street illustrated below depicts a 30-foot roadway within a 45-foot right-of-way. For a yield street to function effectively, motorists should be able to use the street intuitively without risk of head-on collision. 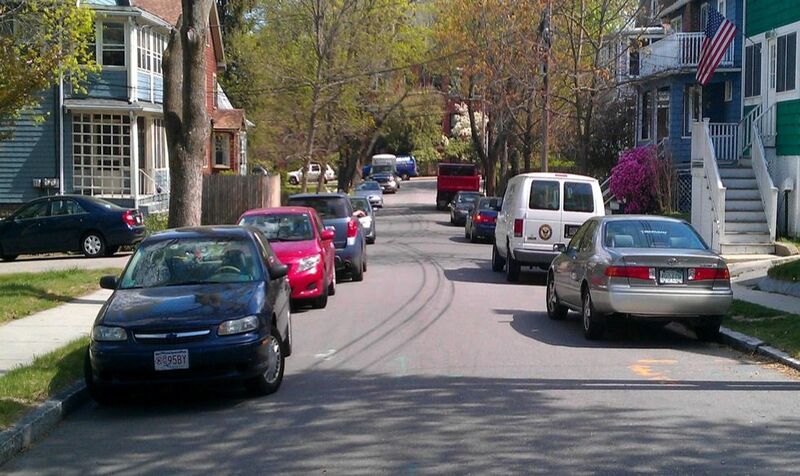 1 All residential streets should provide safe and inviting places to walk and good access to local stores and schools. 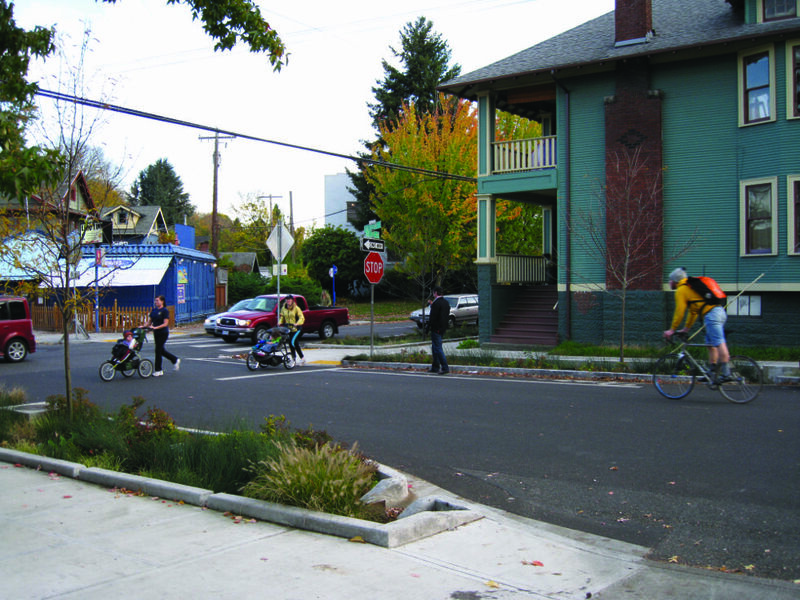 Design should mitigate the effects of driveway conflicts, reduce cut-through traffic, and maintain slow speeds conducive to traffic safety. 2 Driveways should be constructed to minimize intrusion upon the sidewalk. Maintain sidewalk materials and grade across driveways. 3 The planted furniture zone of the sidewalk creates opportunities for street trees, bioswales, pervious strips, and rain gardens. 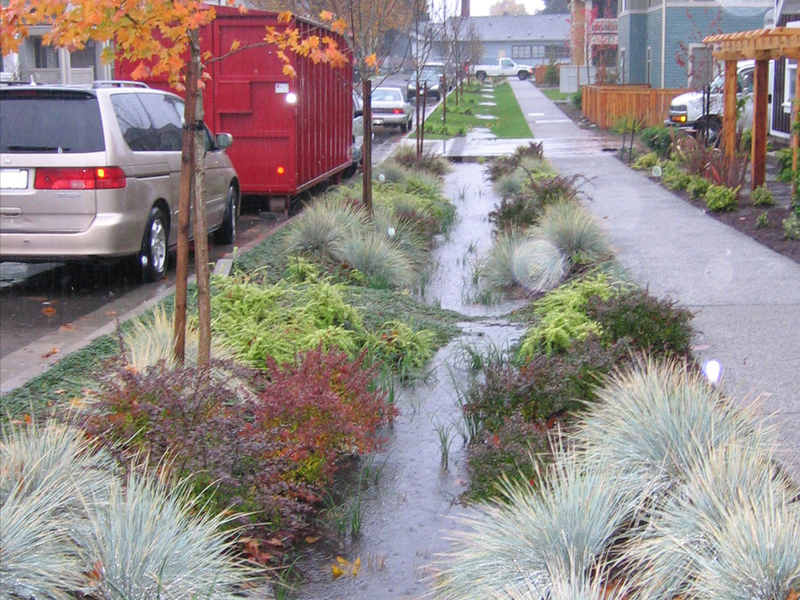 Bioswales may be applied in the furniture zone of residential or low-volume streets to both ecologically and aesthetically enhance the streetscape. 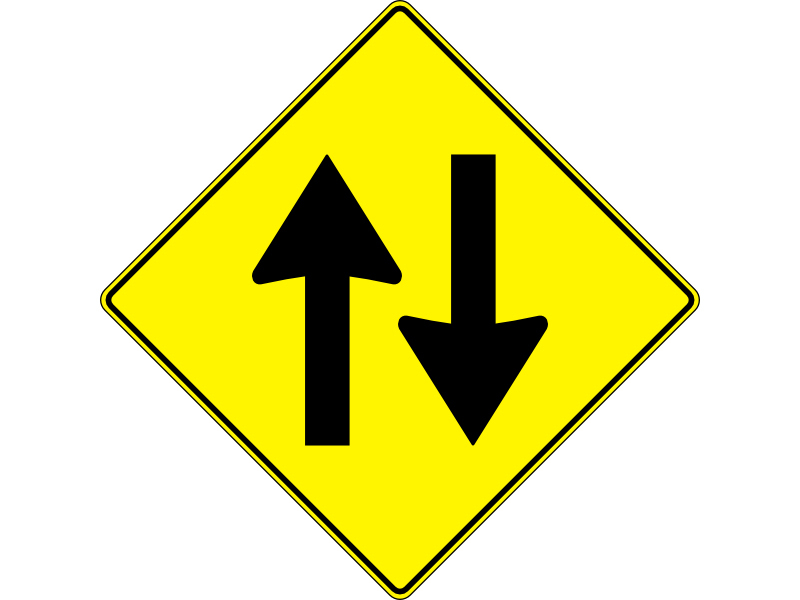 4 While most yield streets should have a minimum of signage and striping, signage should be used to indicate bidirectional traffic at transition points or where 2-way operation has recently been introduced. Parking utilization on yield streets should be monitored closely. 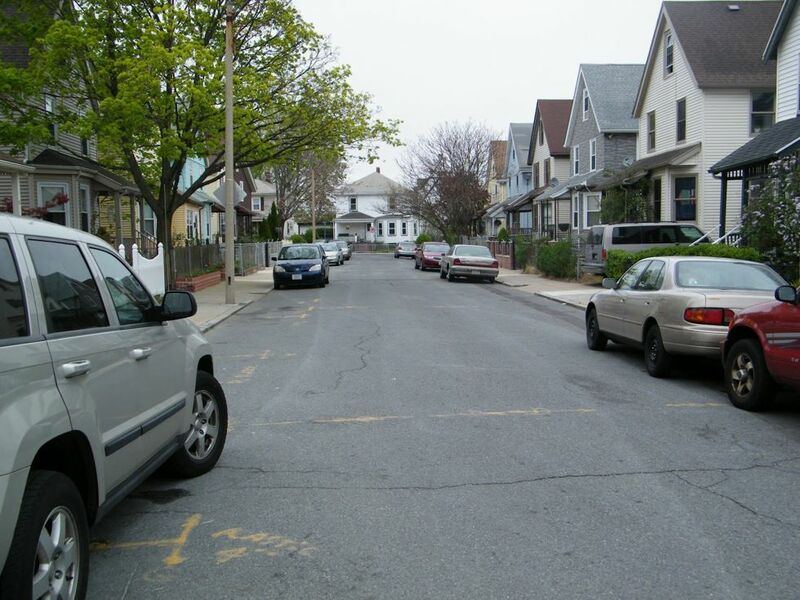 Before and after conversion, cities should consult with local residents to see whether or not a “checkered” parking scheme should be striped or remain unofficial. James M. Daisa and John B. Peers, “Narrow Residential Streets: Do They Really Slow Down Speeds,” (Washington, D.C.: Institute for Transportation Engineers, 1987). Bray, Terrence L., and Victor F. Rhodes. “In Search of Cheap and Skinny Streets.” Places (1997): 11(2), 32-39. Daisa, James M., and J. B. Peers. "Narrow Residential Streets: Do They Really Slow Down Speeds?” Presented at the Institute of Transportation Engineers 67th annual Meeting, Tampa, March 23-26, 1997. Johnson, Jeffrey D. “Defining: An Oregon Standard Definition for Skinny Streets.” Strategic Management of Change Course, NFA, 2001. References for Yield Street: 3 found. Johnson, Jeffrey D. "Defining: An Oregon Standard Definition for Skinny Streets." Strategic Management of Change Course, National Fire Academy, Emmitsburg, MD. Bray, Terrence L & Rhodes, Victor F.. "In Search of Cheap and Skinny Streets." Places, San Francisco, CA. Daisa, James M & John B Peers. 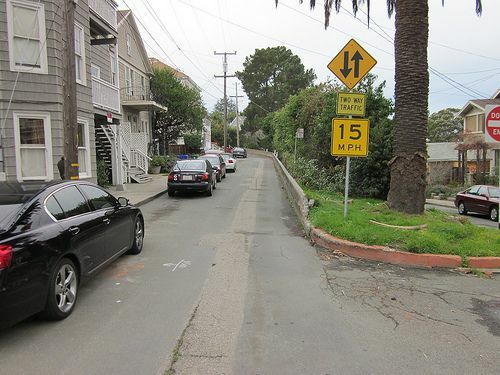 "Narrow Residential Streets: Do They Really Slow Down Speeds?." Institute of Transportation Engineers 67th annual Meeting, Institute of Transportation Engineers, Tampa, FL.